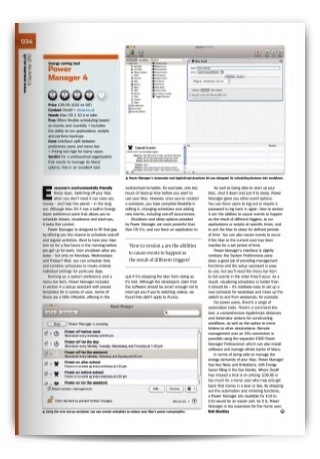 Thanks to Rob Buckley, MacUser UK, for reviewing Power Manager 4. Rob praises Power Manager 4's ability to save our customers' energy. He also highlighted our extensive AppleScript, Automator, and command line support. MacUser UK awarded Power Manager 4 four stars. You can read the full review in the September 10 issue of MacUser UK. The magazine is now available on newstands and is available within MacUser UK's iOS application. This article was posted in PM4, Power Manager, and Reviews and tagged dssw, MacUser UK, Power Manager, review, and Rob Buckley.